An international group of psychoanalysts and film scholars address the enduring emotional legacy of the Holocaust in Cinematic Reflections on the Legacy of the Holocaust: Psychoanalytic Perspectives. Particular focus is given to how second and third generation survivors have explored and confronted the psychic reverberations of Holocaust trauma in cinema. This book focuses on how film is particularly suited to depict Holocaust experiences with vividness and immediacy. The similarity of moving images and sound to our dream experience allows access to unconscious processing. Film has the potential to reveal the vast panorama of Holocaust history as well as its intrapsychic reverberations. Yet despite the recent prominence of Holocaust films, documentaries, and TV series as well as scholarly books and memoirs, these works lack a psychoanalytic optic that elucidates themes such as the repetition compulsion, survival guilt, disturbances in identity, and disruption of mourning that are underlying leitmotifs. 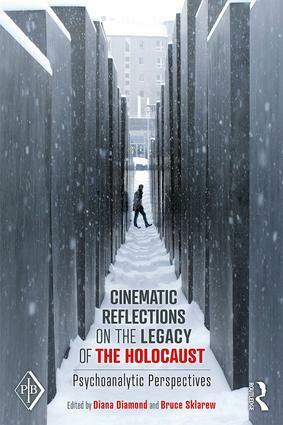 Cinematic Reflections on the Legacy of the Holocaust will be of great interest to psychoanalysts and therapists as well as to scholars in trauma, film, and Jewish studies. It is also of interest to those concerned with the prevention of genocide and mass atrocities and their long-term effects. Introduction by Diana Diamond, Ph.D. The art and angst of viewing Holocaust films byBruce Sklarew, M.D. Six Million and One: A documentary by Anna Ornstein, M.D. Between forgetting and remembering: Two films of Alain Resnais by Lissa Weinstein, Ph.D. The Pawnbroker by Robert Winer, M.D. Multiplicity, Dissociation and Mentalization in Hannah Arendt by Pam Katz and Margarethe von Trotta by Diana Diamond, Ph.D. and Elliot Jurist, Ph.D.
From Shoah to Son of Saul: Cinematic Traces and Intergenerational Dialogues by Catherine Portuges, Ph.D. Son of Saul: The remains of civilization by Clara Mucci, Ph.D.
Sadomasochistic regression in The Night Porter byBruce H. Sklarew, M.D. To know or not to know? Common themes in Ida and The Flat by Emanuel Berman, Ph.D.
Inheriting Nazisim: Refelections on the film Two or Three Things I Know about Him by Régine Waintrater, Ph.D. Discussion by Nanette Auerhahn, Ph.D. and Dori Laub, M.D. Diana Diamond is Professor of Psychology at City University of New York, and is on the faculty of the NYU Postdoctoral Program in Psychotherapy and Psychoanalysis and the Weill Cornell Medical College. She has written numerous articles on personality disorders, attachment theory and research, mental representation and the application of psychoanalytic theory to the understanding of narrative and symbolism in cinema. She is the co-author or co-editor of four books, including Attachment and Sexuality (Routledge, 2008) and the forthcoming A Clinical Guide to Treating Narcissistic Disorders: A Transference Focused Psychotherapy (Guilford Press). She is also in private practice of individual and couple therapy and psychoanalysis in New York City. Bruce Sklarew is a practicing analyst in Chevy Chase, MD who co-edited four books, including The Last Emperor: Multiple Takes (Wayne State) and Bernardo Bertolucci: Interviews (University of Mississippi), and authored over fifty papers on film and applied analysis in communities. He originated Recover, a bereavement program at the D.C. Morgue. He is the film editor for The American Psychoanalyst and The International Journal for Applied Psychoanalytic Study.